I was having dinner with an old friend this weekend, and I told her a story from school. 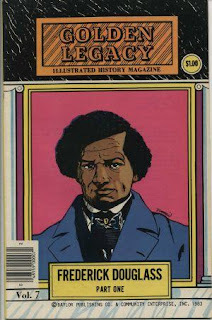 I had just read the two-issue Golden Legacy biography of Frederick Douglass and -- lo and behold -- there was Douglass' name in our 8th grade American history textbook not a week later! Except the entirety of the textbook's coverage of Douglass was two sentences. I remember thinking at the time, "What the hell?!? I just learned about how important this guy was in the history of equal rights, and he's barely given a mention in the book we're supposed to be learning from?" I think that was the definitive point when I realized that somebody was selling us kids an incomplete/skewed worldview. She didn't remember the textbook entry (Why should she? It was only two sentences!) but wasn't surprised by the white-washing of history. What she WAS surprised about, though, was that there were comic books that were non-fiction biographies! It's not a popular genre, certainly, but one that has been around for a while. That Douglass biography was first published in 1969, after all, and I know there were others before that. Comic book biographies are actually something I've been actively looking for the past couple of years. I've found that there are an inordinate number of bad ones, even when talented comic creators are working on them. There seems to be a conflict creators have when telling a real life story between being as accurate and faithful to the truth as possible, and making minor embellishments/alterations for the sake of good storytelling. Some creators even seem to go so far as to stick exclusively with confirmable historical records, and don't even take the liberty of adding in any dialogue! But even if the execution of a biographic comic book isn't as good as it might be, I still find them useful/interesting for the educational aspect. I can still learn about people and events that I might not have known about otherwise. Just last week, I was talking about how I was able to how I only knew about Roberto Clemente because of the recent graphic novel of his life. I was reading at lunch today a bad, but still informative, biography of Nelson Mandela. I learned about people from Mother Theresa to Che Guevara to Jack Johnson to Bertrand Russell through comics. There's one about Hunter S. Thompson that I'm hoping to pick up soon, and another about Richard Feynman that's due out later this year. But there's still a lot of people out there who think comics = superheroes and funny animals. Tell people there's other cool stuff out there that might teach them a few things as well. 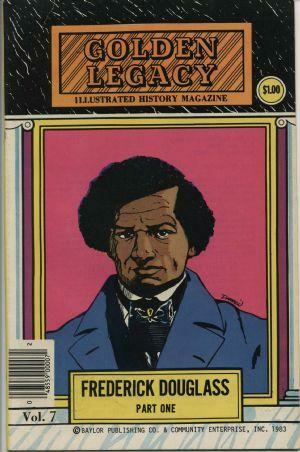 Give out some biographical comics to nieces and nephews as gifts, based on their interests. There are some really awesome books out there, and it's only a matter of telling people they're available. Cool that you have a range of these; look forward to some more thoughts on this subject some day.